This upscale subdivision is a lovely neighborhood located in Greenville County, 9 miles from Greenville. Spaulding Farm homes for sale are custom built with elegant design and charm. Manicured lawns and sophisticated oak trees are seen throughout the streets of Spaulding Farm, however one of the more unique features of this community is that is has been designed to look like a Kentucky horse farm. There is an abundant amount of greenery and charming stone gate that sits as at the entrance. All lots are ½ an acre in size, while several properties have over an acre of land allowing for plenty of yard space for each and every home. There are over 350 homes in this community, most of which were built in the early 1990’s. Don't wait any longer! Browse our listings below or continue reading about Spaulding Farm homes for sale. Spaulding farm real estate is situated on hilly terrain positioned along Roper Mountain Rd. Slate roofs with gabled slopes, manicured lawns and sophisticated oak trees are common traits among these homes. 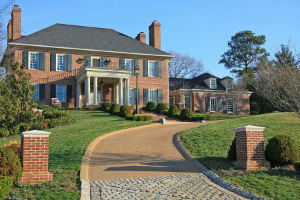 This upscale luxury subdivision is home to many architecturally engaging designs such as Georgian Colonials and Classic Revivals. Many Spaulding Farm homes have brick, stone and stucco exterior finishes. This community has not one, but two great clubhouses for residents to enjoy! There are 2 swimming pools, tennis courts, a fitness facility and 23 acres of common ground. Go for a stroll around the scenic 10 acres of Spaulding Lake, or take part in one of the many clubs. There is the tennis club, book club, Bunco club and more. Schools served by this community include Oakview Elementary, Beck Middle School and J.L. Mann High School. Spaulding Farm is a great place to call home. If you don’t find the perfect home in Spaulding Farms, there are plenty of other Greenville SC neighborhoods we specialize in. Contact us today!